Wholesale bleach safe towels used in hair salons, nail salons or any business looking for towels which can be washed in bleach. Large size of 16x28 extra soft and high end deluxe quality towels. One of the biggest frustrations among homeowners is that the towels they buy simply don’t hold up to everyday life and its spills. They can get spotted and stained due to laundry mishaps or other random situations. That’s why bleach-resistant towels are such a relief to have. 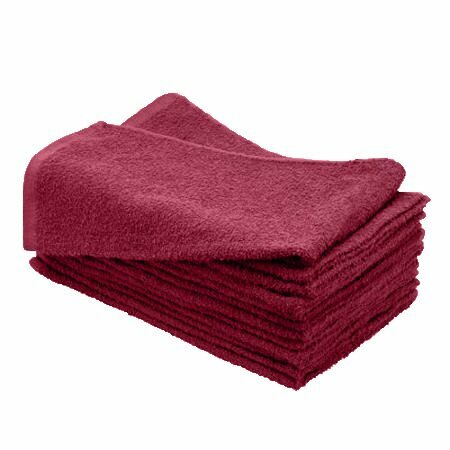 Our bleach-resistant hand towels in burgundy come in units of one dozen and are constructed of 100 percent cotton fibers. Their 16” x 28” size is well-suited for all your hand towel needs, and you’ll find yourself reaching for them again and again. Order from Towel Super Center today to get wholesale pricing on all the towels for your home. Hair Dyes. Many people dye their hair at home and wind up using hand towels in the process. Whether the hand towel is draped around the neck or used to clean up drips of the dye on skin or countertops, the dye can quickly affect the towel. After all, if it can dye hair, it can dye cotton fibers. Acne Medications. Topical acne medications and similar products are used to help reduce pimples on the face and body. However, their ingredients may also bleach fabrics. That’s why so many parents with teens are surprised when they go through towel after towel due to bleaching. Laundry Spills and “Oopsies”. It happens. You throw white towels into the washing machine with bleach. Little did you know that a colored towel was hiding among them! Usually, this ends up with you disposing of the towel or using it as a rag. Clean-up Issues. Quick! A mess has occurred and you need to clean it up — fast! You grab one of your colorful hand towels and use an over-the-counter scrubbing product. Little did you realize that it would end up staining your beautiful towels. Instead of dealing with these all-too-frequent occurrences, invest in burgundy bleach-resistant hand towels. You’ll be less worried knowing your towels are protected.